Add 1 tsp alpha amylase enzyme. Mash at 158 degrees 1 hour. My first all grain batch of brew! 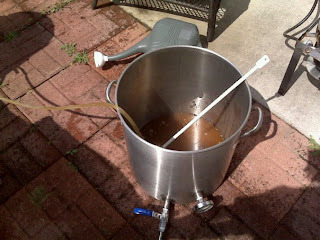 Here is the recipe along with a picture of the mash and the wort lautering into the brew kettle. 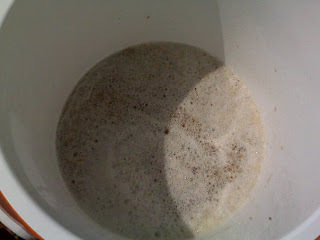 Yay.... (and it's a new brew category - 7B California Common!). Single infusion mash - mash temp 155 degrees for 1 hour. Batch sparged. Got about 60% efficiency. So I have made some equipment modifications and purchases and have now switched over to all grain brewing. I'll post some pictures with my California Common recipe (next). Purchase of Igloo cooler-based mash lauter tun. 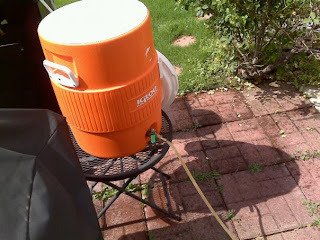 Purchase of a counterflow wort chiller.